So, I’m a bit late with this… but hey, at least I’m blogging again! 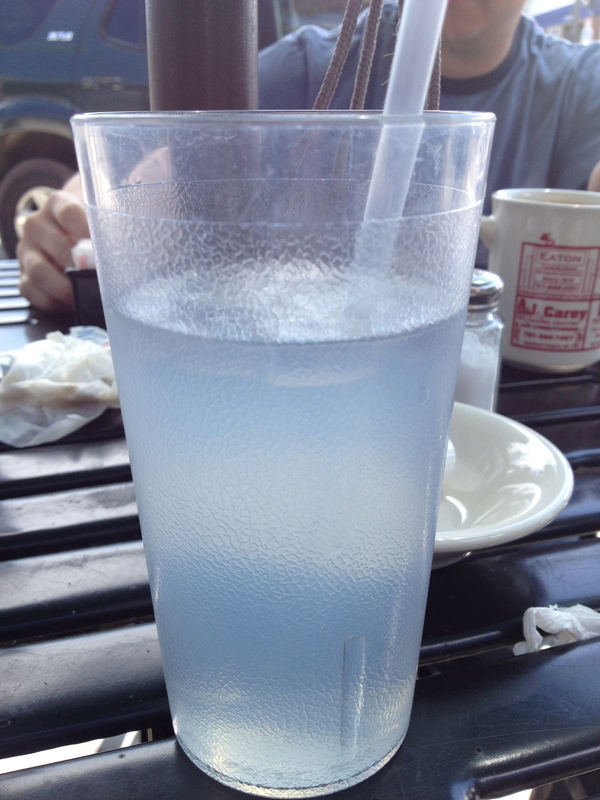 I already posted my menu for Father’s Day dinner… but what I didn’t tell you is that we also went out to brunch. 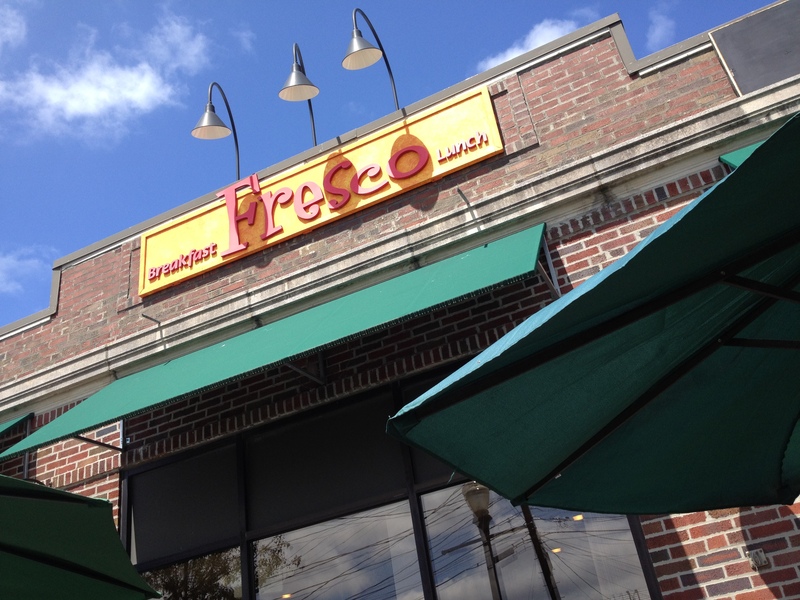 Since we just moved to Dover, MA, we wanted to try a semi-local place (there is NOTHING in Dover, lol), so, we decided on Fresco in Needham. The Yelp review for Fresco was a bit mixed, but we opted to give it a try anyway… as most of them were positive (and this is why we picked it). It was a gorgeous day and at the time, there was plenty of room to sit outside… so we opted for that. The patio filled up VERY QUICKLY after that though, so we lucked out!. The breakfast menu is pretty standard, but one thing I noticed is that it is definitely affordable — so kudos for that! 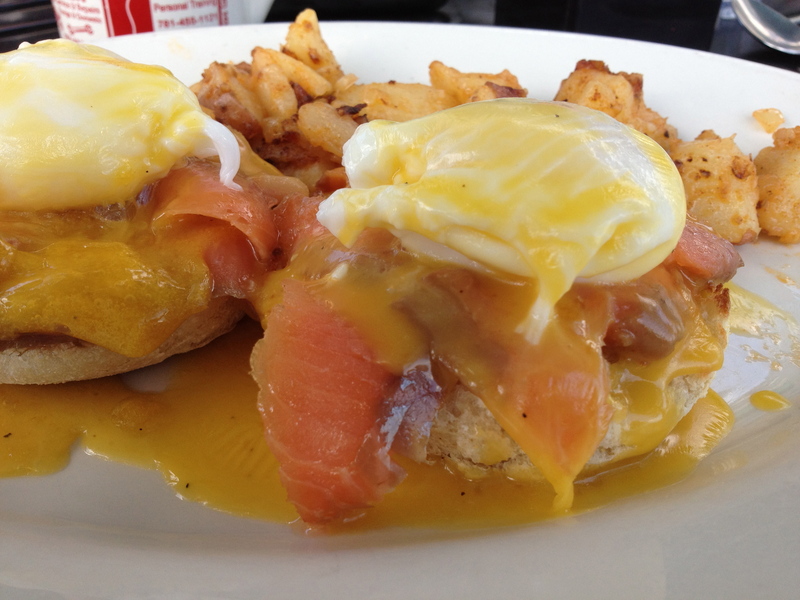 Dan got the Eggs Benedict with Smoked Salmon ($9.50)… it came with a side of home fries and he really enjoyed it. The portion was great, the eggs were cooked perfectly, the hollandaise sauce was lemony and the salmon was fresh. 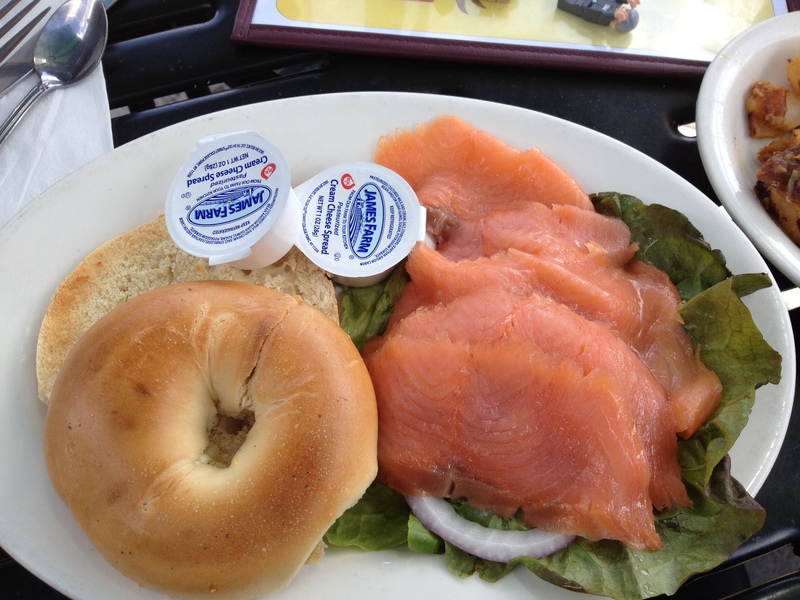 I got the Bagel with Lox and Cream Cheese ($7.50). It was HUGE portion. Too much salmon really. I wish it came with tomatoes and capers though. The bagel was a bit doughy, but to be honest, I’m used to that at this point. I’m from NJ and it’s REALLY hard to find good bagels (and good pizza) in Massachusetts… so I won’t ding them for that. 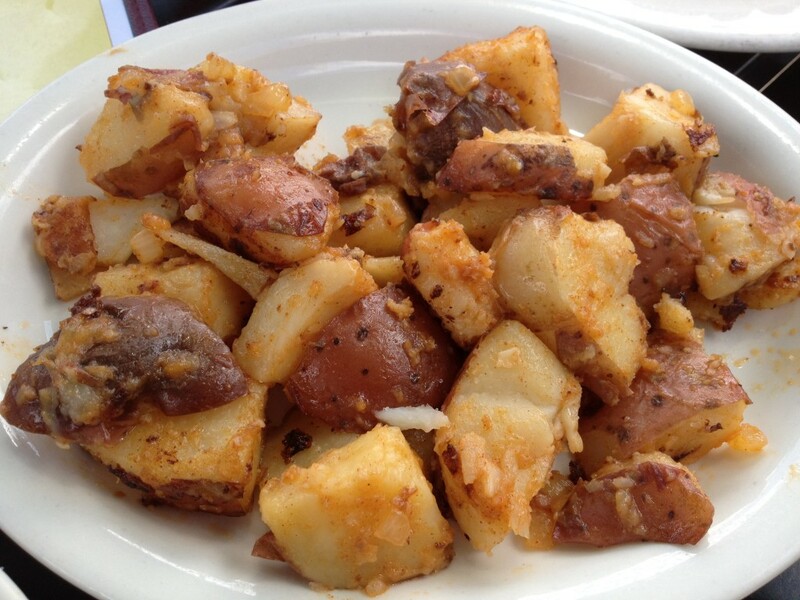 I also opted for a side of Home Fries ($2.25) because the table next to us had them and they looked AND smelled great! They were not disappointing. I loved them and actually enjoyed them even more than my bagel. 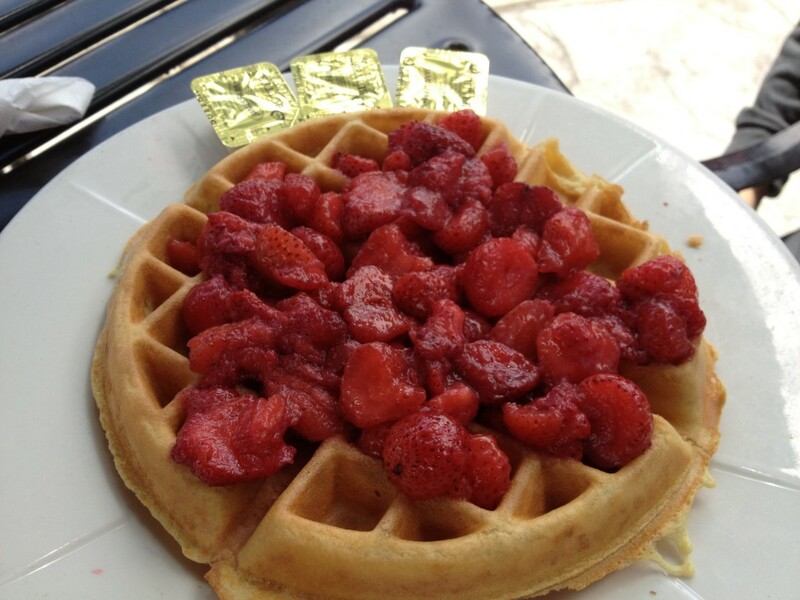 Chance (the 7-yo) got the Golden Belgium Waffle with Strawberries ($5.50). The strawberries clearly weren’t fresh, but they were still quite good. The waffle was full of vanilla goodness and was a tasty treat. Overall, a decent experience. The food is good (not great), is definitely a nice size and very affordable. The service was mediocre at best… as many of the Yelp reviews stated. I ~do~ think they were understaffed the morning, but shame on them for not being prepared for Father’s Day. Would I go back? I suppose. Breakfast is breakfast to me. I’m not one of those breakfast freaks — I definitely prefer lunch and dinner… so maybe I’ll have to give that a shot too. They don’t do dinner, but their lunch menu looks decent (and Greek inspired)… so I’d try it.